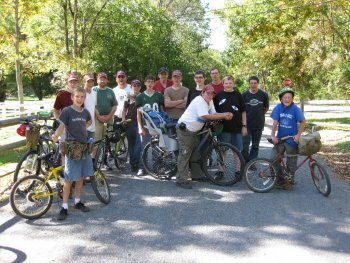 From Thursday through Saturday, September 23-25, Boy Scout Troop 2028, out of Cherry Flats, PA, bicycled the entire 62-mile length of the Pine Creek Rail Trail from the northern to the southern terminuses. They camped overnight, first at the Tiadaghton Campground north of Blackwell on Thursday, then at Black Walnut Campground below Slate Run on Friday. They had a "chase vehicle" to provide them with their food, utensils and other camping supplies. In addition to very much enjoying their stays at Tiadaghton and Black Walnut Bottom, they also commented on how beautiful the Hoffman Campground (just below Blackwell) was, where they made a rest stop. In addition, their one adult leader laughingly noted that during their trip they had been under "severe attacks by chipmunks" on the trail. Saturday afternoon they reached the gate at Torbert Village (the site of this photograph), then proceeded to the Jersey Shore terminus, to be picked up there and transported by motor vehicles back home.